Habitat andrange: Fireweed is found in woods, fields, and waste places from Canada to Florida, Louisiana, and Nebraska, springing up in especial abundance where land has been burned over, whence the name "fire-weed." Description: This weed is a native of this country and is an ill-smelling annual belonging to the aster family (Asteraceae). The stem is from 1 to 8 feet in height, grooved, branched, and juicy. The light-green leaves are rather large, from 2 to 8 inches long, thin in texture, lance shaped or oval lance shaped, the margins toothed or sometimes deeply cut. The upper ones usually have a clasping base or are at least stemless, while the margins of those lower down narrow into the stems. Fireweed is in flower from about July to September, the flat-topped clusters of greenish-white or whitish heads being produced from the ends of the stem and branches. The green outer covering of each flower head is cylindrical, with the base considerably swollen. The seed is furnished with numerous soft white bristles. Collection, prices, and uses: The entire plant is used and is gathered in summer. The leaves turn black in drying. The price paid to collectors ranges from about 2 to 3 cents a pound. An oil is obtained by distillation from the fresh plant. 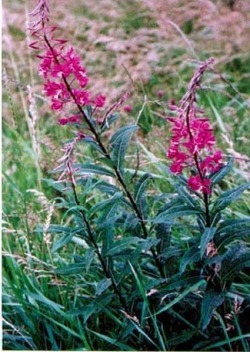 Fireweed has a disagreeable taste and odor. It has astringent, tonic, and alterative properties.